• An area is too hot or too cold. • Too little air being is being delivered to a room, or too much. • The system shuts down for the night before operations do. • The system is too noisy. While this feedback is important in day-to-day operations, it does not tell facility managers much about the overall performance of the HVAC system, nor does it tell managers what occupants need or expect. That information can be developed only by communicating with occupants. Walk the building. Talk to the building occupants. What do they need to support their operations? 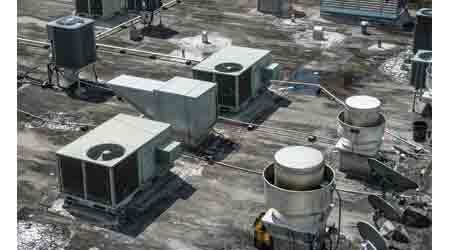 Are there operations that require special HVAC services? Do they operate equipment that has demanding requirements for temperature and humidity control? What are their hours of operation? Remember, the primary purpose of any HVAC system is to provide comfort to occupants and to support their operations. If you do not know what their requirements are, it will be impossible to provide that necessary support. The next step in the evaluation process is to perform a visual inspection of the entire system, from the outdoor air intake grill to the room diffusers. At this point, it is not necessary to take measurements; that will come later. The purpose of the visual inspection is to identify conditions that would negatively affect the operation of the system. Start with the outdoor air portion of the system. Is the outdoor air intake grill located near a source of contamination, such as a loading dock or a dumpster pad? Is the grill free of debris or is it clogged? Has the damper control been disconnected? Is there damage to the ductwork that would interfere with how much outdoor air is being drawn into the system? Inspect the air handler. Is there corrosion on the unit’s casing or condensate pan? Is water dripping from the unit? Are the filters structurally sound? Have control linkages been disconnected or wired in a set position? It is not that uncommon to find that changes have been made to system controls in order to achieve a “temporary” solution to a problem, only to have that solution become permanent even though it may be harming performance. Trace the ductwork throughout the facility. Is it structurally sound, or has it been damaged so that it leaks or restricts airflow? Are the fire dampers fully open? Is the airflow through the duct relatively quiet or does it make unusual noises? Duct noise can be the result of leaks, excessively high air flows, or partially closed dampers.